Making the Best of It: Dandelion, Against the Grain, and Ice Fall—Feel The Change | Flickr - Photo Sharing! 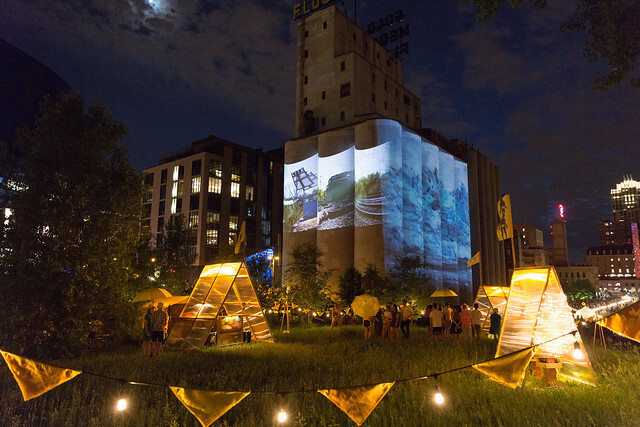 Marina Zurkow with Valentine Cadieux, Aaron Marx, and Sarah Petersen, Making the Best of It: Dandelion, West River Parkway, Northern Spark 2016; Keri Pickett, Jason Takahashi, and Charlie Thayer, Against the Grain, Chicago Mall, Northern Spark 2016; Joshua McGarvey and Heckadecimal, Ice Fall—Feel The Change, Mill Ruins Park and Gold Medal Silos, Northern Spark 2016. Photo: Dusty Hoskovec.